By Annalyn Ng, Ministry of Defence of Singapore. Therefore, instead of analyzing all 4 nutrition variables, we can combine highly-correlated variables, leaving just 2 dimensions to consider. This is the same strategy used in PCA – it examines correlations between variables to reduce the number of dimensions in the dataset. This is why PCA is called a dimension reductiontechnique. Meat items (blue) have low PC1 values, and are thus concentrated on the left of the plot, on the opposite side from vegetable items (orange). 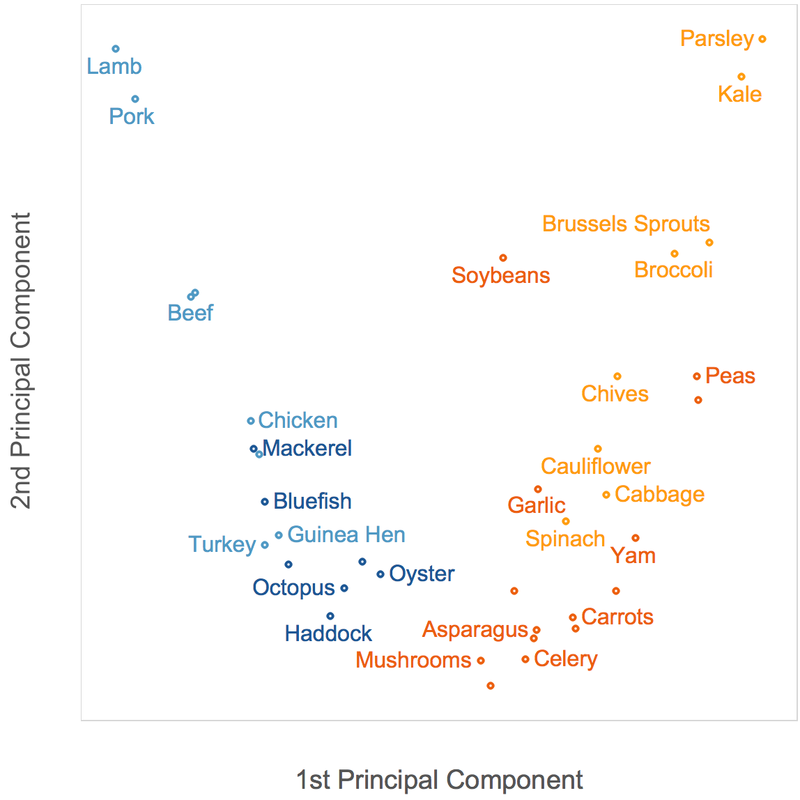 Among meats, seafood items (dark blue) have lower fat content, so they have lower PC2 values and are at the bottom of the plot. Several non-leafy vegetarian items (dark orange), having lower vitamin C content, also have lower PC2 values and appear at the bottom. Did you learn something useful today? We would be glad to inform you when we make a new post, so that the learning continues! Sign up for our notifications plus exclusive email-only data science tips. Bio: Annalyn Ng has worked as a data analyst at Disney Research, Cambridge University, and Singapore's military. For more posts like this, visit: https://annalyzin.wordpress.com.